MordredKLB and 1 Guest are viewing this topic. is it possible to offer a enhanced %played_per_day% to show 3 or 4 digits after the decimal point? now %played_per_day% shows only 2 digits is meaningless for most songs, as I have 10k songs with more than 10 years in library. Haha, yeah. The problem as I see it is there's a way to get the list of all Loved tracks, but it's not possible to take that list and apply it back to all songs in your library. i.e. I can start playing "Song 1" which is loved in last.fm, pull the list of loved tracks from last.fm and mark "Song 1" in the library as loved. I can't pull the list of all last.fm loved tracks and then find "Song 1", "Song 2", "Song 3" in the library and mark them as loved. The comparison has to be done for each track in the library to determine whether it is loved or not. That seems to limit the usefulness a little bit. I don't care about those 0.0001 and 0. The problem as I see it is there's a way to get the list of all Loved tracks, but it's not possible to take that list and apply it back to all songs in your library. Yes, for this very special case, returning lastfm info as a playlist makes more sense. That's what I did with softplaylist at the beginning, and than mass-edited the playlist tracks (I store this information in a real custom id3 field, because I want it to be file-related). Since then, I only use softplaylists to synchronize my loves and bans from player to web and not viceversa. 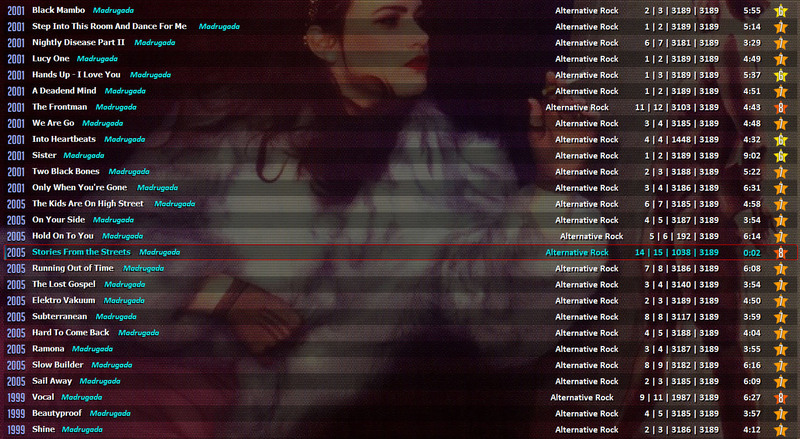 Retrieving lastfm data as a playlist doesn't make sense for similar artists and tags, though, not for me at least. These should rather be stored in tag-related virtual fields and formatted as JSON objects, like the %lastfm_played_times%. It really looks like a natural addition to your component. I'm in love with the new last.fm feature (subscribers only) to manually edit scrobbles (possible since yesterday?) and I was wondering how the component's dealing with those manual edits. Unfortunately it seems like the data cannot be received for the edit songs. 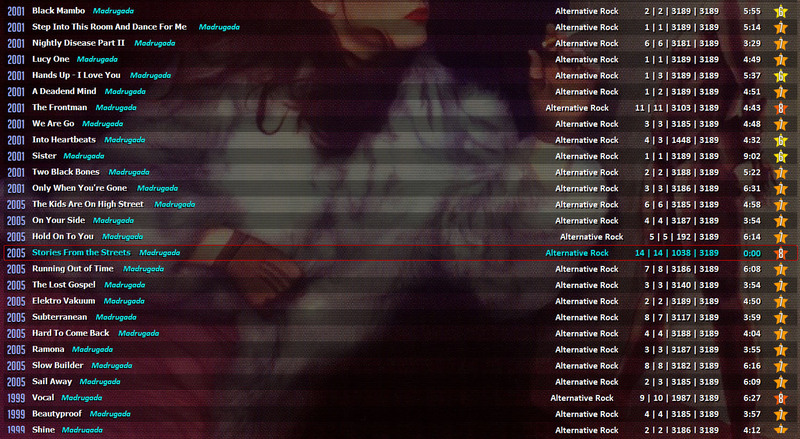 For example: I've edited 32 scrobbles of one song, which had an annoying typo all the time. On last.fm the correct change was smoothly taking into account, but after I used the functions to clear and get the last.fm scrobbles with your component in foobar, I just have gotten the value 0. Do you know why this is happening? Is it possible to programm a work around in this case? How do you plan to deal with it in the future? @Smakaveli I'm 99% positive this is because this component currently relies on hitting an endpoint which uses a legacy backend database that does not replicate those edits. When I release the updated version of this component (it's basically ready to go, but I want to clean up some stuff) it should work seamlessly. Beta 1 version using the new last.fm API. Please let me know any issues you find here. Right now there's no throttling other than the natural throttling due to slow API calls. Please don't hammer Last.fm by requesting scrobbles for 10k songs at once. I'll build throttling in if it's a problem. I'll add some restrictions and throttling as needed once I figure out the best course of action there. thank you once again for your quick support. The beta works like a charm and fixes my problem I've had. Playcounts for Artists or Tracks with '&' in the name/title are not updating properly in Beta 1 when importing. Great catch. It looks like '&' and '#' are the only characters that need to be escaped. Tried it out with a bunch of other common punctuation, and multibyte characters and had no issue. I figured it was something simple like that. I'll let you know if I have any issues with it when I install it later today. Thanks. You guys have complained about the occasional popups when playing a new track, and marc2k3 decided to step in and save you guys by using a background thread pool which doesn't block the UI, and doesn't display a popup. We're all in his debt. Let me know if you guys experience any issues with this latest beta. Emigrating from an early version 3 to the newest I seem to have some troubles getting my scrobble playcount. Console says last.fm Error: Login: User required to be logged Found 0 plays in last.fm (since last recorded scrobble) when trying to get last.fm scrobbles. My last.fm username is filled in, is there another login procedure that needs to be done? The earlier version has no issues getting the data but it's not always correct in getting the right numbers. "User required to be logged in" means the user has their recent scrobble history set to private. I think that may be a bug for this new method, though - thanks for bringing it up. Guess they haven't fixed that. Yep, mine were set to private. No more issues when disabling private scrobbling. Do wish to be able to use private in the future (along with this component). Agreed. If for whatever reason last.fm can't or won't make the change, I might need to replicate the last.fm authorization that foo_scrobble uses. Presumably that would prevent the API calls from failing even if set to private. Hi MordredKLB! Thanks for this excellent plugin, it works a charm! I think the checkbox for "compare album fields" doesn't work when you disable it. I have at least one song that has scrobbles from both the single and the album version (with the single version receiving significantly more plays)--but regardless of whether I check the box or not, it will only give me the album plays when I attempt to update the playcount. Unless I'm misunderstanding how it works? I'm using v4.0.0b3. EDIT: I just realized I needed to clear the plays and re-get the data. False alarm! I noticed I seem to be getting the wrong amount om retrieved scrobbles so I did some checks. Just to be clear with "wrong amount" I mean the scrobbles returned are more than what is shown on the last.fm track page. 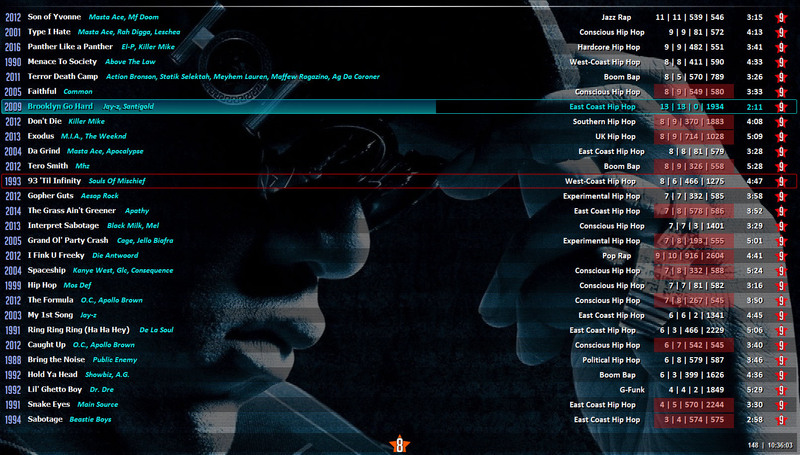 Here's a screen shot of a sample of 28 tracks. Look at the relevant set of 4 numbers to the right. The first number represent local playcount, the second number is the last.fm playcount (ignore the third and fourth numbers, they are irrelevant to this problem). Those highlighted in red are all wrong retrievals meaning the scrobble number on the track page are actually equal to the local playcount but for some reason when importing using "get last.fm scrobbles" it increments the scrobble with 1. As seen this doesn't happen with all tracks. Of this sample of 28 tracks 12 are wrong. The only consistency is that's always a wrong increment by 1. If the difference between local playcount and scrobble count is +2 and I check the track page the scrobble count is correct. With this sample about 40% of tracks have wrong scrobble imports. When I clear the scrobbles and do an import again the same tracks have the same issues. I can't fully trust foo_enhanced_playcount to represent the correct scrobbles since in about 40% of cases it doesn't show the actual scrobble count but always one too high on the bad ones. Can you uncheck the option "Increment Last.fm playcount when %play_count% increments"? It uses some logic that says if the %last_played% > %lastfm_last_played% add 1 to %lastfm_playcount%. The idea is that %lastfm_playcount% would always lag behind %play_count% (which gets incremented 1 minute into a song) so try to keep them in sync. I'm ahead of you there, I tested it both with the increment option on and off. Each time clearing it and then again applying get scrobbles. It seems to not make a difference. If the update happens while playing it seems to go ok but I can only check a limited number of tracks like that as it requires a listen of the track. When a track with a bad import, lets say it has 3 actual scrobbles but the import says 4, when it updates (with increment on) it becomes 4 without incrementing to 5 which is then correct. Also some tracks I have are double (or more) and the +1 import only happens on one version of a particular track. Lets say I have 3 tracks with the exact same tag name. I import the scrobbles and they all say 3 scrobbles, which is correct, except one which says 4. Btw, I leave compare album field uncheck always; never use that option. Just tried it again without increments checked but this time on a smaller batch of files (couple of hundreds instead of 3000+). On smaller batches it seems to be way,more correct but I need to check the tracks individually with the corresponding track page and check for doubles with extra plays to see if it's really correct. That's super weird. Are you using the latest beta or v3.x? Yes sometimes it's correct and sometimes it's not. But it does seem like increments have something to do with it. Leaving it on and doing mass import does indeed create wrong numbers on %lastfm_play_count% and there seems to be no consistency between which tracks get +1 added and which ones don't. I think I found it but now I would like to know if this is normal behavior. These are comparisons between the same tracks. First is with increments off, second it with increments on. Note: on this one the few instances where the last.fm playcount is higher it's indeed the correct number if I check the track page. There was no re-import or clearing. This is just selecting increments and restarting foobar. It was my understanding selecting increments meant the last.fm playcount would increment when it's played. Here it seems to show the incrementation happens on tracks even when they aren't played at all (the fourth number in the set of 4 indicates the amount of days ago it was last played, third one is the amount of days since first played i.e. the age of the track...so all of those tracks haven't been played in a while). So is this normal behavior to increment for some reason without track being played?